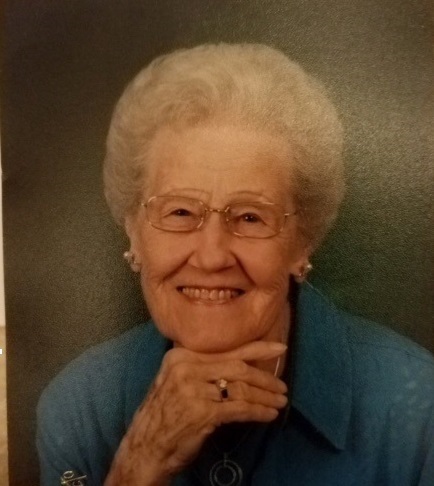 Betty Swift, of Champaign, passed away peacefully at 9:10 A.M. surrounded by family on November 23, 2018, at Amber Glen. Betty was born October 30, 1923 in Pontiac, IL, to Walter I. Carlin and Nettie M. (Holman) Carlin, who preceded her in death. She married Harry R. Swift, June 28, 1945, at St. Mary’s rectory Pontiac, upon returning from the war. He preceded her in death on October 15, 2014. She was also preceded in death by her older brother William W. Carlin and her daughter Carolyn. Betty, early on, was a homemaker raising her three children. Later she was the bookkeeper and maintained records for Chester & O’Byrne Transfer, an Allied Van Line Agent, and Chemical Maintenance Service, businesses she and her husband owned. Upon selling those companies, Betty became involved with Hillier Storage & Moving Co., in Springfield, that her husband and son owned. Betty enjoyed many activities including quilting, playing bridge, baking and putting together puzzles with her family. She was an avid Fighting Illini fan religiously attending football and men’s & women’s basketball games. For many years, Betty donated blood regularly to Champaign Blood Bank. She was very involved with Holy Cross Parish and a past President of Holy Cross Parents Club. She was a member of St. Matthews Catholic Parish. Betty loved the staff at Amber Glen and they loved her. They enjoyed her cheerfulness and took great care of her during her stay. Betty is survived by her daughter Mary (Tom) Walsh of Champaign, son Tom (Billie) of Springfield. Grandchildren Daniel (Michelle) Swift of Springfield, Melinda (John) Stevens of Mascoutah, Kelly (Jake) Potter of Urbana, Craig (Samantha) Held of Pleasant Plains and Carlin (Melissa) Walsh of Irvine, CA. Great Grandchildren Austin (Kristen) Swift of Belleville, Taylor Stevens, Bailey Swift, Bryan Stevens, William Swift, Emily Stevens, David Swift, Ellamarie Swift, Brooklynn Held, Mackenzi Held and Philip Potter. Visitation: The family will receive friends at Owens Funeral Home, 101 North Elm Street, Champaign, on Tuesday, November 27, from 5:00-7:00 p.m.
Funeral Mass: 10:00 a.m. on Wednesday, November 28, 2018 at St. Matthews Catholic Church, 1305 Lincolnshire Dr., Champaign. Monsignor Stanley Deptula will officiate. Burial will be in St. Mary’s Cemetery, Champaign.